If we look back over the last 365 days, the amount of change to the Dynamics 365 platform is staggering. In the grand scheme of things, it really wasn’t that long ago that we were working with a business software platform call Dynamics CRM that was pre-configured for sales, service and some light marketing that could also be extended for unique line of business applications (xRM). That was about it. Now we have the “Power Platform”. We have a plethora of 1st and 3rd party “apps”. There is the constant evolution of ERP applications becoming integrated cloud-based applications. We have “Canvas based” PowerApps and Flow evolving from science fair projects to key components in building enterprise applications. Not to mention Azure, AI and what seems like a million features with the word “Insights” embedded. How does your typical developer, solution architect, analyst, consultant keep up with this constant change… AND spend 8 hours+ working on projects? In the book “7 Habits of Highly Effective People“, one of the habits is “Sharpening the Saw”. I find this is a very visual analogy. You are in the woods cutting down trees… it’s getting harder and harder to cut down trees because your saw is getting dull. The obvious smart thing is to stop and sharpen the saw, but you don’t because you are too busy cutting down trees. I see a lot of professional folks get into this trap. I find this amplified with people working with Dynamics 365 because there is a lot of project work and the fact that there is so much new stuff coming out that folks sometimes are not even aware of what’s new or what is coming. Are you one of those folks who is “too busy to learn X” (PowerApps, PowerBI, Flow, CDS, Marketing, Field Service, etc, etc) because you are working a ton of hours on a Dynamics 365 implementation? Seems almost counter-intuitive as one of these technologies may actually contain a better, more efficient, more elegant solution than what you are currently implementing! One of the ways to “sharpen” your mental saw is to take advantage of the many Dynamics 365/Power Platform learning and training events that are happening across the world. Chances are there is some kind of professional development event happening not far from where you live. The following is a list of both paid and free events that even just spending a short amount of time will greatly enhance knowledge, awareness and make your mental saw razor sharp! In my opinion, this should be mandatory training for any software developer working with Dynamics 365/Power platform! I am personally going to the Toronto class and it would be great to see you there. Dynamics 365 Saturdays are local events generally organized by local Microsoft MVPs and are essentially a 1-day conference focused on Dynamics 365/Power Platform technology. The sessions are aimed towards Administrators, Analysts, Consultants, Architects, and Developers. Dynamics 365 Saturdays are great because they are free and they pack an amazing amount of content in 1-hour sessions across 2-3 different tracks. There seems to be one happening every weekend in some part of the world. Do you want to hear a secret about Dynamics 365 Saturdays? Much of the content is the exact same as what is presented at the various paid conferences. Definitely worth the investment of a Saturday. Cutting the lawn can wait! If you are doing any kind of work in Dynamics 365, joining one of the Dynamics 365 User Groups provides you with access to a wealth of information, both what is coming and what is current. The various user groups focus on different business solution technologies. Each group provides forums for questions and discussions, webinars, local chapter meetups and of course epic conferences that have days of sessions covering every aspect of working with and implementing Dynamics 365. The user groups run independently of Microsoft, so the “agenda” is set in the working reality of members and not necessarily the marketing vision of Microsoft. I have also found the professional networking within the user groups completely above and beyond anything else that I have been involved with. In my career working with Dynamics 365, the UGs have been key in my own “sharpening the saw”. I am really looking forward to the D365UG Summit coming up in October as well as the Collaborate Canada events in November. Recently, the Extreme365 conference has joined the Dynamics Communities family and will provide great learning opportunities for Dynamics partners in December in various parts of the world. Not to be confused with the user group communities above, the Dynamics 365 Community site is hosted and maintained by Microsoft and is another important resource in keeping your Dynamics 365 saw sharp. The site has forums where pretty much any issue or question you have could be answered, as well as videos, blogs, and other documentation. 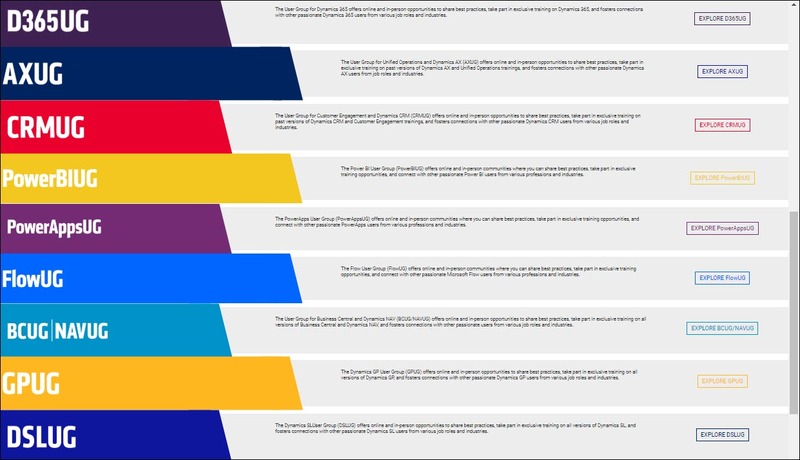 Microsoft has a full schedule of conferences they organize and promote. Recently Microsoft held the Business Application Summit which was fully dedicated to the Power Platform. Other conferences such as Inspire (formerly the worldwide partner conference) and Ignite (Technical conference) have a lot of sessions fully dedicated to Dynamics 365 and the Power Platform. Microsoft conferences provide the vision and tend to announce new and upcoming technology. If there is one key skill that a Dynamics 365/Power Platform professional needs in order to be successful, it is definitely the ability to constantly be learning and mastering new features, apps, techniques, and technology. There are a ton of different classes, conferences, online resources that will help. In most cases, an investment in time is required, but the time saved with this new knowledge will definitely pay off. I realize that can be very difficult, but if the trees are not falling as quickly as they used to in your Dynamics 365/Power Platform projects, then maybe you need to stop and sharpen up that saw! Nick Doelman is a Microsoft Business Applications MVP and enjoys learning about new features of Dynamics 365/Power Platform. Nick is a former employee of Franklin Covey, where he first learned about the 7 Habits (never got to personally meet Stephen Covey, unfortunately). Nick will be presenting at Dynamics 365 Saturday in Washington DC on Saturday, September 22nd and also will be presenting at D365UG Summit in October as well as Collaborate Canada in November. Listen to Nick, Colin and Shawn on the “Refresh the Cache” podcast focusing on Dynamics 365 Portals.